Master game design and digital art principles simultaneously with this all-in-one guide to creating games in the cutting-edge game engine Unity 5. Bursting with images and tutorials, Penny de Byl’s Holistic Game Development with Unity will help the reader gain the multidisciplinary skills needed to succeed in the independent game industry. Holistic Game Development includes new coverage on Augmented Reality, Networking and Virtual Reality such as the Oculus Rift. Learn to combine the beauty of art and the functionality of programming in de Byl’s second edition for Unity game development. Typos & errors found in the text. 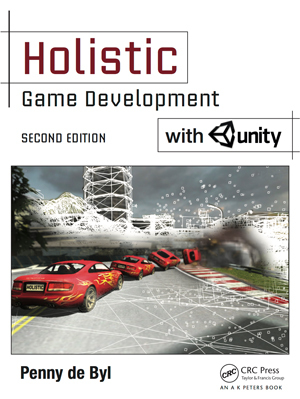 These are the project files required to complete the Hands-On exercises in Holistic Game Development with Unity 2nd Edition. Creating Procedural Artworks with Processing is for those seeking to learn computer programming from the very basics to the more advanced concepts. It uses the Processing language to visualise the concepts through the production of computer graphics that illustrate the coding principles while being artworks in their own right. This book started as a set of tutorials for university level multimedia students to introduce them to computer programming through the development of artworks. It’s therefore presented in a non-threatening way that will ease the reader into programming. 10 chapters building on each other one concept at a time. 20 practical laboratories for exploring digital art and programming concepts. Over 35 detailed step by step hands on activities. Over 95 questions to test your understanding. Answers to all exercises and questions. The chapters are organised to weave together programming functionality and design principles presenting one concept at a time. To Know Thy Computer, explains why computers function the way they do. It presents the fundamental constructs of bits, bytes and binary and demonstrates how computer memory is built and how it is manipulated through code. Getting in Shape, examines all the visual components of art from points and lines through to complex shapes by presenting and demonstrating their mathematical basis and teaching the reader to draw these elements onto the screen with code. Elementary My Dear Watson, returns to the programming side of the content to take a deeper look at logic and demonstrates how it is one of the most important things a programmer should understand if they are to truly harness the power of the computer. Colour My World, investigates colour by holistic means, examining its science, visuality and coding. Colour spaces will be discussed along with the methods for setting colours on the screen. More colour will be included in the Processing drawings by demonstrating how external images can be brought into the program and manipulated for interesting effects. Power to the Programmer, introduces higher level programming concepts that really show off the power of coding and demonstrates how with less lines of code the real power of computer processing can be exploited for repetitive tasks. In addition, the reader will learn how to write simple code that draws shapes that can be repetitively drawn and manipulated with small tweaks to create a plethora of images that through randomness never draws the same thing twice. Transform My World, examines how the drawing canvas and shapes can be manipulated by moving, scaling and rotation. These concepts allow you to draw the same shape over and over again in different locations and ultimately assist you in creating live animated artworks. Transformations are a powerful concept and the foundation of creating fractals. Curves, introduces the drawing and mathematics of curves. As not all objects in the world are constructed with straight lines, this chapter demonstrates how smooth continuous surfaces can be drawn to increase your drawing object palette to include natural structures such as leaves and flowers. Fractals, presents the structure of nature and reveals the true beauty of mathematics. Through iteration of transformations and the drawing of shapes it will be revealed how complex geometrical shapes can be generated as well as natural objects that seemingly defy a fixed mathematical formula such as clouds, landscapes and plants. Patterns, demonstrates how repetition can be applied to designs to form complex drawings that use the same shape or drawing over and over. Objects such as honeycomb and snowflakes will be examined and broken down into their elementary components to demonstrate how transformations and repetition can be used to construct larger repeating images. Images and Text, introduces added functionality available in Processing for the reading in of external files to add interesting features to artworks such as images and text. The use of fonts and text will be explained and their use will feature in several projects including a practical example of producing ASCII art.